Cytomax Performance Drink is made for a different brand of athlete. Its blend of complex carbohydrates and sugars work to sustain energy, so you can train harder, build stamina, and achieve superior results - Proven Results! Natural Herbal “Lift”: (in Tangy Orange, Go Grape and Peachy Keen flavors only) reduces your perceived effort so you can push harder. Simply put, Cytomax outperforms the competition - so you can outperform yours. 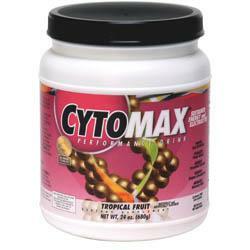 Buy CYTOMAX PERFORMANCE DRINKS Now!